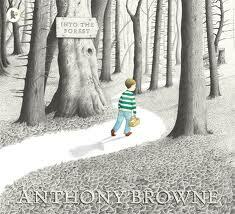 Recently I read our class Into the Forest by award winning author/illustrator Anthony Browne. A boy is awakened by a terrible sound and so some upsetting days begin. Dad is missing from the breakfast table, Grandma is sick and he must take a cake to her. “Don’t go into the forest,” his mother warns. But anxious not to miss his father’s return, the boy decides to take a shortcut through the forest and his strange adventures begin. We certainly connected to the anxiety and suspense along the way to Grandmother’s house. The students expressed feeling worried. Someone said that his tummy felt weird. There was a lot of gasping and held breath. Such suspense. As we came across oddly familiar fairy tale characters, students were eager to shout out their connections. “That must be Goldilocks!”, “That’s not that candy one where the witch takes them is it? It is? !” One student described the feeling the book gave her as a “tingling in your brain” because it seemed like we knew the story but we kept worrying about what might happen. Finally, all is well. Our happy ending finds Dad and a recovered Grandma and boy and father return home to Mom. Watching the students connect, predict and infer, I was reminded about how important it is to develop rich story schema with our students. They need to know their fairy tales, fables, favourite rhymes and be exposed to literature from a variety of genres. When they bring this rich experience to “new to them” books, they are able to interact with the book on a much deeper level as they pick up on nuances, allusions and references to other stories. As parents and teachers, we must read, read read and then read some more! A few days later, I found another (new to me) Anthony Browne book at the public library – also giving a new twist to a well known fairy tale, Goldilocks and the Three Bears. 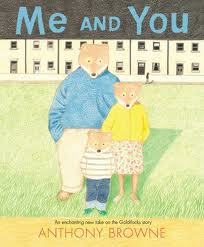 Me and You does an amazing job of telling simultaneous stories, letting us into the world of Goldilocks while at the same time we revisit the familiar story about the bears. As we flip through this book, we find two stories. On the left, sepia images of the little girl, out on an errand with Mom and then suddenly, lost. Her story is wordless, told just through the images. Lost. Afraid. Alone. Finding a cozy home, a snack, a warm bed. Being discovered and racing away. Walking through rain, empty streets and then finally, into the arms of a searching Mom. On the right, we follow little bear and his Mummy and Daddy as they head out for a walk and then return home to find a stranger in their home. A version of the Goldilocks story that we are very familiar with. Full of comforting colours. Lots of happy yellow, soothing blues, calm greens. I love the last line of the book. Little bear looks out of his window, thinking about the girl. “I wonder what happened to her.” This story definitely blurs the absolutes of fairy tale right and wrong and introduces a lovely element of empathy. I am a big, big fan of Anthony Browne! This entry was posted in Picture Book Love and tagged Anthony Browne, fantasy, favourite illustrators, fiction, great read alouds, library books, picture books, schema, wordless by carriegelson. Bookmark the permalink. I didn’t know you had such a great blog; however, my favourite Anthony Browne book is “Voices in the Park” and it is fabulous. It is about 4 people going to the park and their perspective on the event. So, it is written in 4 different “voices”. A great book to use when teaching about perspective taking. I haven’t updated my blog in a while; very busy! I think you just can’t go wrong with Anthony Browne! I love the Piggybook a lot too. 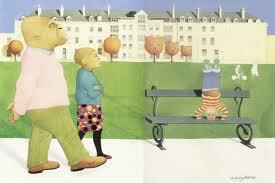 And of course all of the Willy books – think we might go on an Anthony Browne reading spree after the break!